The Mansfield Story Page- a study of how the covered bridge festival moved its center of activities to Old Mansfield Village. Mansfield, Indiana. Old Mansfield Village, an Indiana hamlet with fewer than twenty permanent residents, is located in the southeastern corner of historic Parke County on the Big Raccoon Creek five miles south of Bellmore on Indiana State Road 59. At one time State Road 59 wound its way through Mansfield and crossed the Mansfield Covered Bridge just south of the roller mill at the site where the Mansfield County Store stands. It is just 14 miles north of Interstate 70 and can be reached by taking State Road 59 - Exit 23. For 2018 Covered Bridge Festival the dates are October 12th-21th It is estimated by festival officials that over two million tourists visit the Covered Bridge Festival each October. That is a truly amazing feat during the ten-day period. Each year visitors come from throughout the world to see the many historic sites and eat and shop at the some 4000 vendors in the county. Mansfield is by far the largest, popular and most visited venue during the Covered Bridge Festival. The village of Mansfield grew up around a roller mill that was built there in 1819 by James Kelsey and Francis Dickson. A simple 30-foot by 30-foot log building housed the first mill that served the needs of a growing number of settlers to the newly formed state of Indiana. 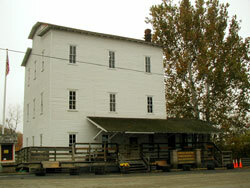 Frontier mills served as the center of new communities and attracted both people and businesses. 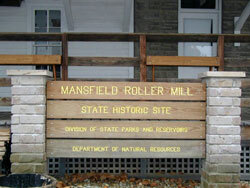 A sash mill was added to the Mansfield Mill early on and was followed by a carding mill to process wool. One machine in one hour could card the same amount of wool that a person carded in an entire week. 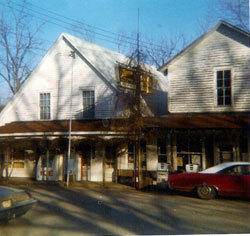 A general store, blacksmith, cooperage, wagon maker and other business were added to Mansfield. As the population expanded a church and a school were organized. Early settlements typically developed around the major and minor waterways of the heavily woodland territories that made overland travel difficult before the development of a road system. Ownership of the mill changed within and between generations. For this reason the Mansfield Mill has been known by several names and has provided a growing configuration of services over its lifetime. 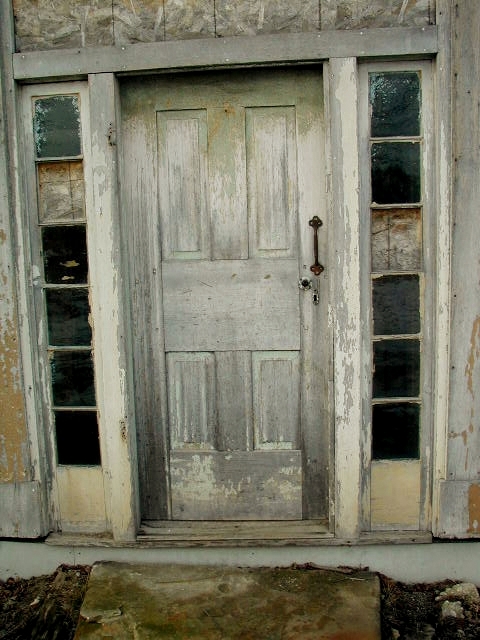 Surviving the passing through of several owners it was acquired by the Hutcheson and Dalton families in 1991. With a stroke of Hoosier generosity it was donated by them to the Indiana State Museum System and has been restored for future generations to enjoy. Visit it during the summer months and during the Covered Bridge Festival and see three floors of machinery intact with a working turbine. (Not a water wheel so often associated with grain mills). See the world famous Mansfield Covered Bridge. Parke County Indiana is often touted at the “Covered Bridge Capital” of the world. While other states have more covered bridges no other county can boast of more covered bridges. As a mater of record, thirty-two of Indiana’s ninety-two covered bridges are found in Parke count. Many of the bridges still serve local traffic on a daily basis. Some have been closed and have a modern bridge build adjacent to them with a small picnic area for weary festival travelers to rest and enjoy the construction techniques used in the building of the bridges. Most of the bridges rest on Indiana Sandstone that was quarried locally in the Big Raccoon Valley. The quarry, Chicago Brownstone Company, was open for years and exported stone for the building of the famous Brown Stone buildings in Chicago and the east coast. During its peak, the quarry employed seventy-five men and exported a rail car of stone daily to help meet the needs of a growing America. Stone is being quarried today from the same vein that supplied the brown stone that was used to build an expanding America. Joseph J. Daniels built the two-span Burr Arch Construction Bridge at a cost of $12,200 in 1867 and is the longest covered bridge in Parke County, spanning 247 feet. Daniels moved to Indiana in 1850 and began his bridge building career. He moved to Rockville in 1861 and built bridges in the area until his death at the age of 90. His grave and those of his family are in Parke County. The arches rest on Big Raccoon Valley sandstone from the area. Traffic uses the bridge daily to commute to work and for leisure. It is possible to walk under the bridge and view the construction techniques used. Daniels built 12 of the covered bridges in Parke County, 9 of which are still standing. His favorite construction technique was the Burr Arch method that combined a large wooden arch that rested on the sandstone piers and is combined with a King Post Truss to allow for spanning longer distances. 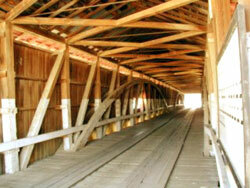 He built a total of 29 covered bridges (25 Burr Arch Truss and 4 Howe Truss) in Indiana - 18 of them still stand. The earliest bridge was the Jackson Bridge in 1861 and the last one in Parke County - the Neet Bridge built in 1904. Few original buildings still remain in Mansfield but the Mansfield Country Store is an example of two buildings that were built in the 1820s to serve the community. 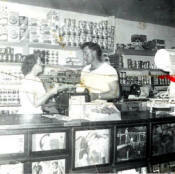 Barter was often the method of exchange for local farmers and settlers. Today the store buildings are used for local crafters and artists to display their hand-made items to the Covered Bridge Festival and other festival visitors. A large wood deck overlooks the Big Raccoon Creek and affords a spot for photographers to capture pictures of the mill dam, bridge and creek. Other locations have been improved to afford mud free shopping and eating. A food court is available during the Covered Bridge Festival on the scenic Big Raccoon Creek next to the Mansfield Bridge and another one is available on top of the hill just west of the bridge. You can find restroom facilities at both locations. Joseph Smith, the founder of the Mormon Church, crossed the Big Raccoon Creek at Mansfield on May 24, 1834 during the famous March to Zion in Missouri. Festival visitors are treated to an array of vendors that cannot be found any other place in Parke County during the Covered Bridge Festival. Local crafters provide folk-art products along with objects with modern refinements. Food vendors provide something for nearly any taste and two food courts provide a place for weary tourists to rest their feet and enjoy the dining fare. Some vendors provide what some call flea-market goods but are more accurately described as manufactured goods. Bargain hunters have a field day shopping at these booths. Parking is provided (at a fee) for thousands of visitors on both sides of the Big Raccoon Creek. Some vendors are in tents while others set up in building which line the main street. The historic Mansfield Bridge is filled with foot traffic during the ten days. People from throughout the U.S. visit Mansfield and the other venues in the county. Come and visit during the Covered Bridge Festival or the other festivals and events held throughout the year in Mansfield. Stay at the Mansfield Guest Inn and walk along the historic Big Raccoon Creek and enjoy the Mill Dam and Mansfield Roller Mill. Your photographs will have a special quality not possible any other place in Indiana. revised October, 2017. Copyright; do not copy or reproduce without written permission.